Penalty kicks were needed to separate DCU and Mary I in the opening round of the Collingwood Cup in Belfield this afternoon, with DCU coming out on top in the shootout. DCU captain and new Shelbourne signing Robbie Gaul calmly slotted the winning penalty in sudden death, finding the bottom corner with his right foot and sending his side through. It was a game that should have been over long before it was finally settled, with DCU dominating possession and creating great goal-scoring opportunities throughout the match. The game started quietly, with DCU looking comfortable in possession and Mary I employing a more direct style than their Dublin counterparts. There were few notable glimpses of goal before DCU found the opener in the 20th minute. Adam Byrne got away from his man down the left-wing and sent in a dangerous low cross which centre-back Michael Keating attempted to block, but toe-poked into the roof of his own net. After scoring, DCU continued to push for goals, with midfielder Conor Ralphe showing his ability to dictate the game from the middle of the park. Right-back Darrren Craven was also impressing, as his long searching through balls caused problems for the Mary I defence. Daniel Mahon went close for DCU after half an hour. Mahon’s left-footed effort from the edge of the box whistled past the top left-hand corner. It was all DCU for most of the first half but Mary I did spurn a good chance after 35 minutes. DCU goalkeeper Ben Dale spilled a long punted free and Ollie O’Driscoll pounced in a crowded area but couldn’t capitalise, as his lob landed on the roof of the net. The second half started as the first had ended, with DCU applying all the pressure. Substitute Dean Cregan fired just wide from 18 yards and minutes later Daniel Mahon showed his pace by beating his man, but hit a tame effort into the hands of the keeper. DCU were cutting Mary I open at will, but they would rue their missed chances as the Limerick College found an unlikely equaliser in the 81st minute. A good long throw caused chaos in the DCU box and fell to the feet of substitute William Brush 10 yards out. Brush showed great composure by selling two dummies before sidefooting right-footed past Ben Dale in the DCU goal. There was still time for more drama and it predictably took place in the Mary I box. Adam Byrne had a strike cleared off the line with two minutes remaining and minutes later centre-forward Mahon saw his free-kick graze the top of the crossbar. Extra-time was a cautious period, but DCU did have one more golden opportunity to avoid the lottery of a shootout. Ralphe put the lively Cregan through on goal with just the keeper to beat. With the ball bouncing, Cregan lobbed the on-rushing keeper but the ball bounced wide with the goal empty, meaning the game headed to penalties. Both sides missed their first penalties, after which we saw an exhibition of wonderful penalty taking, bringing the shootout into sudden death. The marathon game was finally settled after all of 16 penalties. 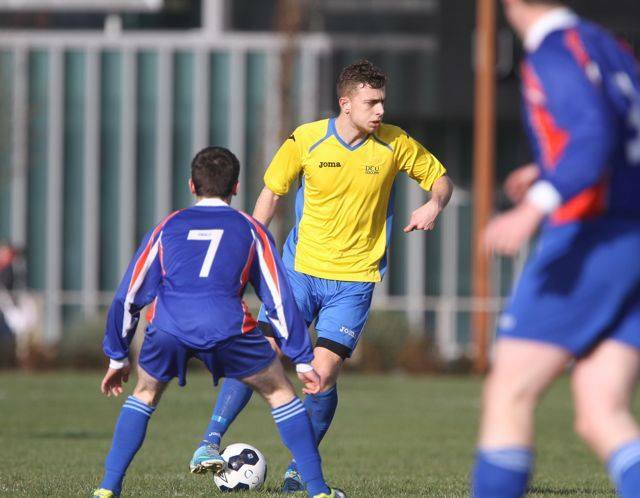 Daniel Sheehy went for a low strike but it lacked power and was thwarted by DCU’s Dale. Up stepped captain Gaul to give his side the victory in a game they very nearly let slip. DCU will now take on UUJ in the quarter-final tomorrow. DCU: B Dale; D Craven, T Lahiff, R Gaul, P Kavanagh; S Madigan, M Cogley, C Ralph, D Mahon, J Mooney, A Byrne.